Sixteen students, who attend non-traditional high schools across the island have been rewarded for their outstanding performance in academics by the National Child Month Committee (NCMC). 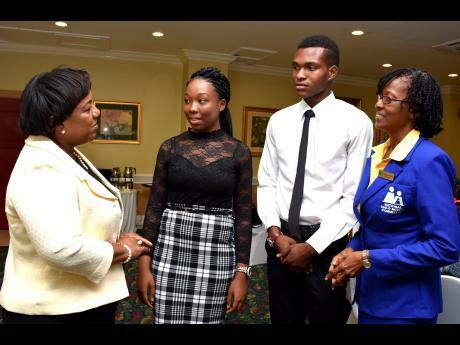 Contributed CEO of the Child Protection and Family Services Agency, Rosalee Gage-Grey (left), speaks with Britney Huie (second left) from Irwin High School in St James and Emroy McKenzie (second right) from Kemps Hill High School in Clarendon, who were named the Top Girl and Top Boy respectively, at the National Child Month Committee's (NCMC) Youth Academic Achievement Awards ceremony, held at The Knutsford Court Hotel in New Kingston on Wednesday. Looking on is Dr Pauline Mullings, chairperson at NCMC. The students, many of whom face various challenges, were fÍted at the NCMC's annual Youth Academic Achievement Awards ceremony held on Wednesday at The Knutsford Court Hotel in New Kingston. They received gift baskets and certificates, book vouchers, plaques, among other things. Britney Huie from Irwin High School in St James and Emroy McKenzie from Kemps Hill High School in Clarendon, who were named the Top Girl and Top Boy, respectively, expressed gratitude for the recognition. "I feel real good about being awarded today. My hard work and determination has paid off," said Huie. McKenzie said he is "truly grateful for this award. I've worked really hard to overcome my challenges, and it feels good to be recognised." The other students honoured are: Vernal Headley from Hopewell High in Hanover; Shadia Franklin from Troy High and Ramonia Downer from Albert Town High in Trelawny; Sadiki Lindsay from Aabuthnott Gallimore High in St Ann; Janelle Hallwood from Port Antonio High in Portland; Dacia Dixon from Yallahs High in St Thomas; Omarie Davis from Penwood High and Anthony Higgins from Tarrant High in St Andrew; Tyra Hepburn from Bridgeport High in St Catherine; Toriann Ellis from Denbigh High in Clarendon; Joshoy Stephens from May Day High; Jayda Morgan from Winston Jones High in Manchester; Deandrea Green from Roger Clarke High in St Elizabeth; and Deandra Smith from the Salvation Army School for the Blind and Visually Impaired.